KUALA LUMPUR (May 17): ACE Market-bound building contractor Inta Bina Group Bhd's initial public offering (IPO) for the public portion has received an oversubscription rate of 42.74 times. In a statement today, Inta Bina said a total of 12,574 applications for 1.17 billion new shares valued at RM292.64 million were received from the Malaysian public for 26.76 million new shares that were made available for public subscription. It said 20.01 million new shares available for application by eligible directors and employees of the group had also been fully subscribed. Inta Bina said that in addition, the placement agent has confirmed that 53.53 million new shares that were allocated to selected Bumiputra investors approved by the ministry of international trade and industry (MITI) and 6.75 million new shares made available for private placement to identified investors had been fully placed out. Inta Bina managing director Paul Lim Ooi Joo said this marked a positive beginning for the company and provided a firm signal of the marketability of its shares and the underlying confidence in the company's performance over the long haul. "We are certainly encouraged by the overwhelming response, which is testimony to the public's confidence in the inherent strengths of Inta Bina Group. "I am confident that Inta Bina Group will grow stronger, better and more competitive and we will strive to ensure that we do not disappoint our shareholders and investors who placed their trust in us," he said. Under the listing exercise, Inta Bina has raised RM26.76 million from its public issue of 107.05 million new shares at an issue price of 25 sen per share, of which 26.76 million new shares were made available to the Malaysian public via balloting; 20.01 million new shares for its eligible directors and employees; 53.53 million new shares reserved for private placement to selected Bumiputra investors approved by MITI while the remaining 6.75 million new shares were earmarked for private placement to selected investors. As part of its listing exercise, the existing shareholders of the company also made an offer for sale of 26.76 million shares to selected investors by way of private placement. Of the total IPO proceeds, RM5 million (18.68%) will be used mainly for capital expenditure to purchase various machineries and equipment as well as to replace the fully depreciated equipment; RM9 million (33.63%) to repay bank borrowings; RM9.56 million (35.73%) for general working capital requirements, which will be used to finance Inta Bina's day-to-day operations for its ongoing and future projects, while the remaining RM3.2 million (11.96%) will be used to defray listing expenses for the IPO. Inta Bina said all notices of allotment for these shares will be mailed to successful applicants on or before May 24. Inta Bina's listing is tentatively scheduled on May 25. M&A Securities Sdn Bhd is the adviser, sponsor, underwriter and placement agent for the IPO exercise. 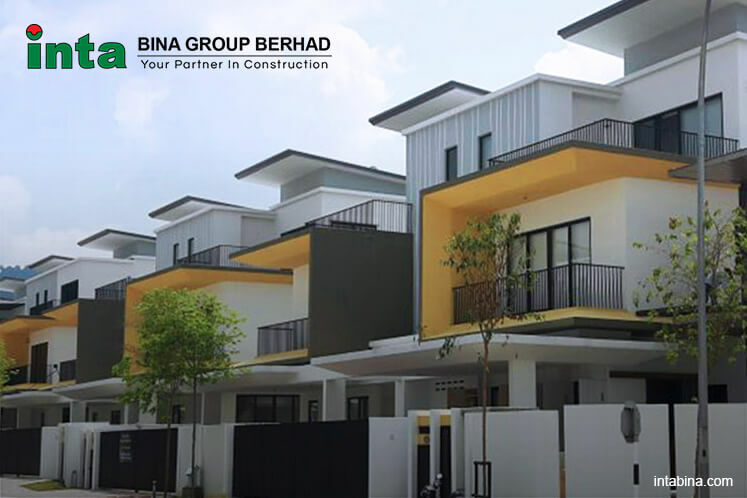 Inta Bina has more than 25 years of experience as a building contractor in Malaysia, where it is involved in securing and carrying out construction contracts. It provides its expertise as the main contractor for construction projects including residential, commercial, industrial and leisure properties. To date, Inta Bina has completed more than 110 building construction projects mainly in the Klang Valley and Johor with total contract value of more than RM2 billion. Its clients include a diversified pool of property developers which are subsidiaries of public-listed and non-public listed companies such as Eco World Development Group Bhd, Gamuda Bhd, UEM Sunrise Berhad, Mah Sing Group Bhd, Tropicana Corporation Bhd, Mitraland Group Sdn Bhd, Engtex Group Bhd, Singapore-listed Lum Chang Holdings Ltd, Paramount Corporation Bhd, Plenitude Bhd, S P Setia Bhd, Perdana ParkCity Sdn Bhd and Selangor Dredging Bhd.